“Palmetto Moon” inspired “The Huffington Post” to rave, It is always nice to discover a new talented author and Kim Boykin is quite a find. Now, she delivers a novel of a woman picking up the pieces of her life with the help of two spirited, elderly sisters in South Carolina. 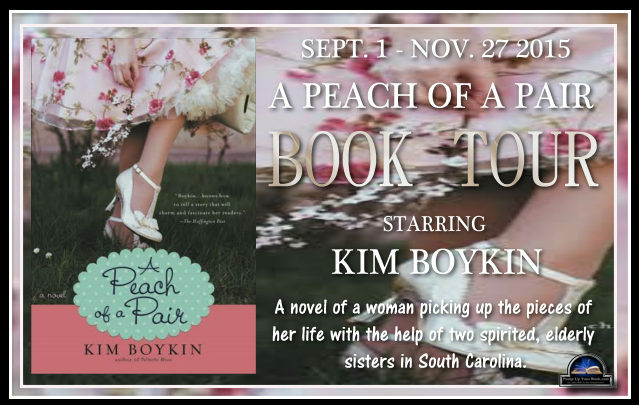 A Peach of a Pair is available at Amazon. It might seem cruel to send this letter along with a proper invitation, but I couldn’t bring myself to call you, and I wasn’t given much notice regarding this matter. I also know you well enough to know you would have to see the invitation to truly believe it. Although I do regret not having enough time to have them engraved. I’m sorry to be the one to give you the news about Brooks and Sissy. I love you, Nettie, and I love your sister. I’m not condoning her behavior or the fact that she is in the family way, but you are blood. You are sisters. No man can break that bond, not even Brooks. There’s money and a bus ticket paper-clipped to the invitation. I’ve checked the schedules. You should be able to leave Columbia on Thursday the week of the wedding after your morning classes and get back by Sunday night. I know how you hate to miss class, and if you are also missing some wonderful end-of-the-year party, I’m sorry. So very sorry. But the milk has been spilled, Nettie. Come home and stand up with your sister. She needs you. She’s a wreck, and it makes me worry about the baby. First and foremost, I’d like to start out by saying that the synopsis was what initially drew me in. 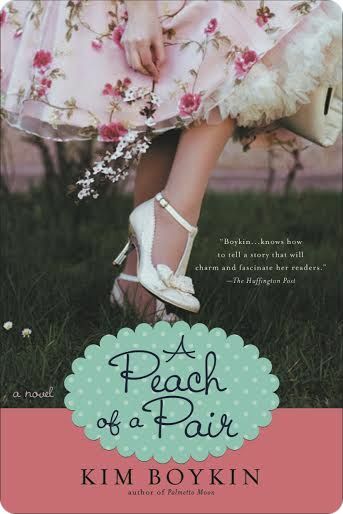 The cover helped convince me to read A Peach of a Pair. Normally, I don’t stray too far from the paranormal genre, which is my absolute favorite, but this story was a nice change. Nettie’s tale drew me right in. She’s an enjoyable character, well-educated, down to earth, family-oriented with a quiet, albeit, sincere personality. Her desire to complete college before getting married, putting education before anything else made her even more of a realistic person in my eyes. I loved that she had goals and was more than happy to see them through before she picked up the pieces of the life she left behind back home. Unfortunately, not all in life goes as planned and Nettie’s soon encounters a hurdle she had not foreseen. Her pain after finding out about her sister’s and fiancee’s betrayal is was raw and so real. Utterly heartbroken, she doesn’t quite know how to continue on and looks for an escape. Her reaction is more than understandable, considering how deep her family has cut her. Nettie needed to find herself again, to put herself back together, and by taking a job at the Eldridge’s sister’s house she gives herself the opportunity to start anew, fresh. Emily Eldridge is a tough cookie to please. She’s bossy, kind of controlling, and arrogant to some extent too, but even with all her flaws I couldn’t bring myself to hate this particular character. I liked her a lot because despite her bad attitude and her hot temper, Emily is also very loyal. Through all of the problems she and Lurleen had in the past, I found her devotion to her only living relative very sweet, heartwarming, and rewarding even. Except for Sissy and Brook, I absolutely loved every other character in this book. Remmy, Katie, Lurleen, and even Sue did balance the story out and each one brought their own grain of happiness to Nettie’s life. Each personality was well-developed and believable. Each person shone and stood out. I found the fact that Nettie could forgive her sister so easily, in spite of the pain she caused her, exceptional. Maybe this makes her a better person than me. I don’t know. Regardless, living with the Eldridge’s sister did help Nettie cope. Perhaps in the most unconventional way, but her life was never the same afterwards. The ending surprised me. Did not see it coming, but I love surprise ending so there’s no complaint there. Whether or not this genre is my cup of tea, I found myself immersed in the story from the very first chapter. I’m not going to lie, I finish this book in like three sittings. Would have finished it sooner but kiddies demanded attention so had to give up reading for a few hours each day. Anyway, this was my first book by author Kim Boykin and I enjoyed it from start to finish. If there’s anything I wish there would have been more of that is Nettie’s and Remmy’s relationship. I would have loved to see more of them as a couple, but I’m really happy they had each other in the end. I give this one two big thumbs up! Thanks to the lessons she learned under that mimosa tree, her books are well reviewed and, according to RT Book Reviews, feel like they’re being told across a kitchen table. She is the author of A Peach of a Pair, Palmetto Moon and The Wisdom of Hair from Berkley/NAL/Penguin; Flirting with Forever, She’s the One, Just in Time for Christmas, Steal Me, Cowboy and Sweet Home Carolina from Tule. 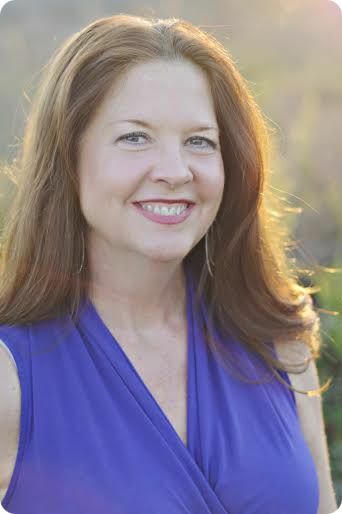 While her heart is always in the Lowcountry of South Carolina, she lives in Charlotte and has a heart for hairstylist, librarians, and book junkies like herself. Her latest book is the southern women’s fiction, A Peach of a Pair. Connect with Kim on Facebook and Twitter. Find out more about Kim at Goodreads.